Investors processed a disappointing second-quarter earnings report, along with details on the growing cost of the Family Dollar merger. What: Discount retailer Dollar Tree (NASDAQ:DLTR) saw its stock slip lower by 13% during the month of September, according to S&P Capital IQ data. That slump has pushed shares into the red for 2015, although Dollar Tree is solidly outperforming the market over the last 1-year, 5-year, and 10-year time frames. So what: The stock found more sellers than buyers last month after Dollar Tree on Sept 1 posted second-quarter earnings results that failed to meet Wall Street's expectations. Revenue, which was goosed by the acquisition of former rival Family Dollar, surged higher by 48% to hit $3 billion. And profit improved by 10% to $0.67 per share. However, the pros were looking for slightly bigger numbers: $3.3 billion of sales and $0.68 per share of earnings. 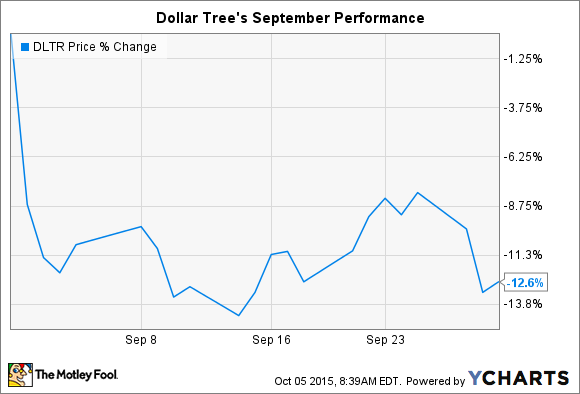 Beyond those headline figures, Dollar Tree's second quarter was characterized by slow but steady growth. Sales at existing stores rose 2.4%, representing a slowdown from the prior quarter's 3.1% rise. The retailer's profitability also took a hit: Gross profit margin fell to 28% from 34%. Management blamed a large, planned markdown of a chunk of Family Dollar inventory for that dip. Yet it's the integration of the Family Dollar business that will likely have the most significant impact on shareholders over the next few years. Dollar Tree executives are optimistic that the merger will eventually pay off for investors. "This combination provides us with the unique opportunity to better serve a broader range of customers, while enhancing our ability to deliver long-term profitable growth for our shareholders," CEO Bob Sasser said in a press release. Now what: Sasser and his team issued guidance for the full year that calls for a comparable-store sales growth pace in the "low single digits," roughly on par with the 3% rise it has booked through the first half of 2015. Yet the company declined to provide an earnings forecast for this year, citing significant upcoming costs associated with merging its operations with those of Family Dollar. That uncertainty around profits -- and the risks involved with combining two huge retailing companies -- likely motivated some investors to turn bearish on the stock last month.